I have previously posted an image from this fanstastic June night – Friday Photo ###. That one was looking directly into the sun. This is just a few meters away, looking across the soft pastel light that was falling over the landscape. As much as the northern lights keep me up late in winter, that can involve a bit of suffering at times. In summer, under the midnight sun, it is generally just pure joy. 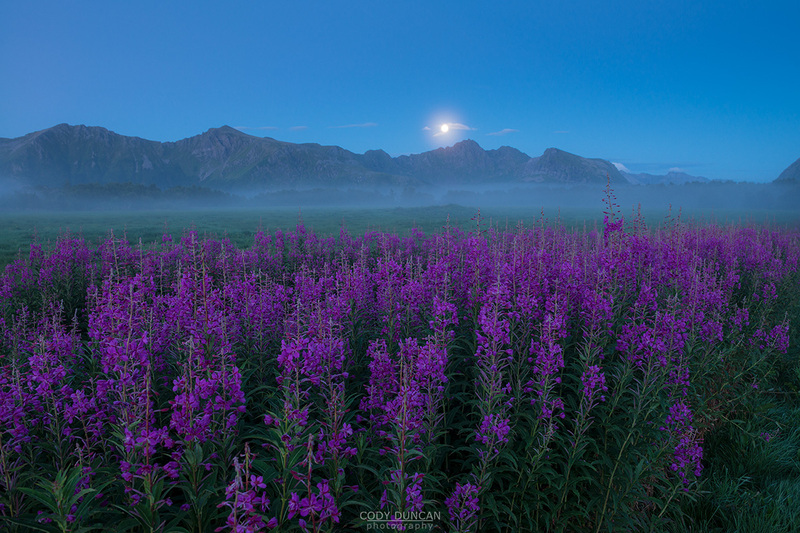 Lofoten really is a land for insomniacs! While the sun had been shining bright and strong a little while earlier, it eventually sunk into some clouds lower on the horizon. The light was still warm, but now with a gentle softness. Nights like this are why I moved here, and with as many reasons as there are to visit at other times of the year, a warm summer night under the midnight sun is simply wonderful. Something that everyone should experience once. Another midnight image from Gimsøy. After a long winter and this years cold may, it is so nice to see the fields first turn green and then, in the first weeks of June, fill with a endless color as a million flowers cover the land. Often, especially in the last years as I have focused more on the mountains, I forget to look at the small scenes and simple moments. 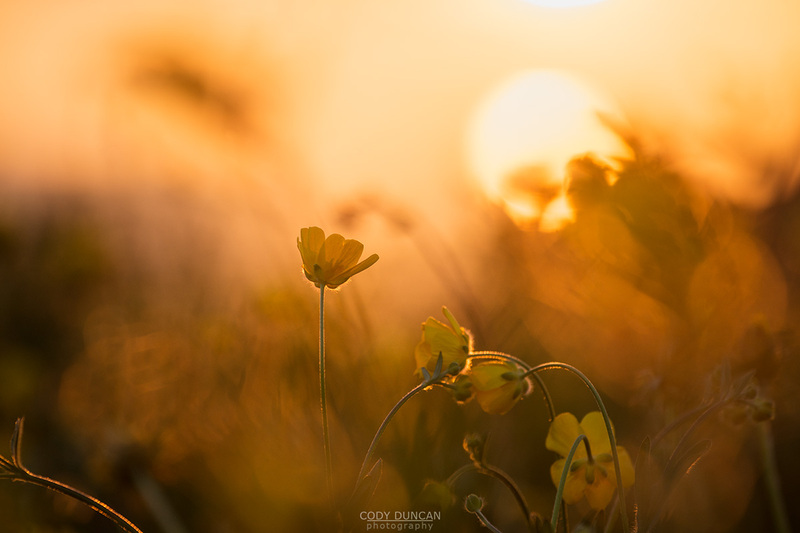 And what is more simple than a flower in a field with the warm glow of the midnight sun shining in the background. Perhaps this could be anytime of day and any place in the world. But to me, this is a nice, simple pause in the passing of the days here in the north. Even thought the midnight sun doest look visually different than a sun low on the horizon at any other time of the day, there is just something magical about being out late into the early morning and it never getting dark. Part of me wishes the whole year could be like this, but then it wouldn’t be special. 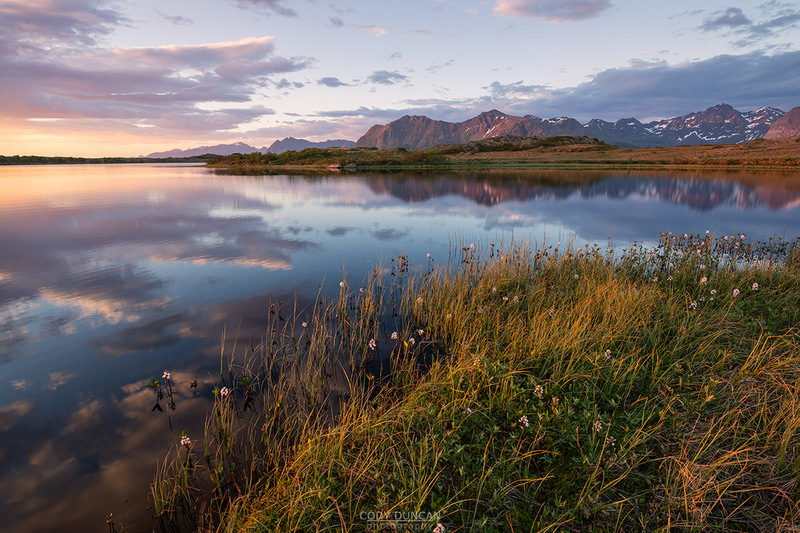 Guiding a workshop from Tromsø to Lofoten this June, we had absolutely perfect timing with the weather. A few days before I drove north it had still been snowing here and I was telling everyone to make sure they had good jackets. However as I reached the airport in Tromsø after a night camping on Kvaløya, it’s a long drive from Lofoten, it was t-shirt weather and sunshine! Endless sunshine for days and days. After some time on Senja we made the journey south to Lofoten. This was the first night when we finally got some nice drama in the sky, the other days being mostly cloudless. So we headed off to Gimsøy to do some exploring. This was the last stop of the evening as we were on the way back to Henningsvær. I’ve stopped by this small lake dozens of times over the years, but I think this is the best I’ve seen it! The sun was perfect, just below the layer of clouds that had been growing throughout the evening and the rest of the world was still and silent. perfect. 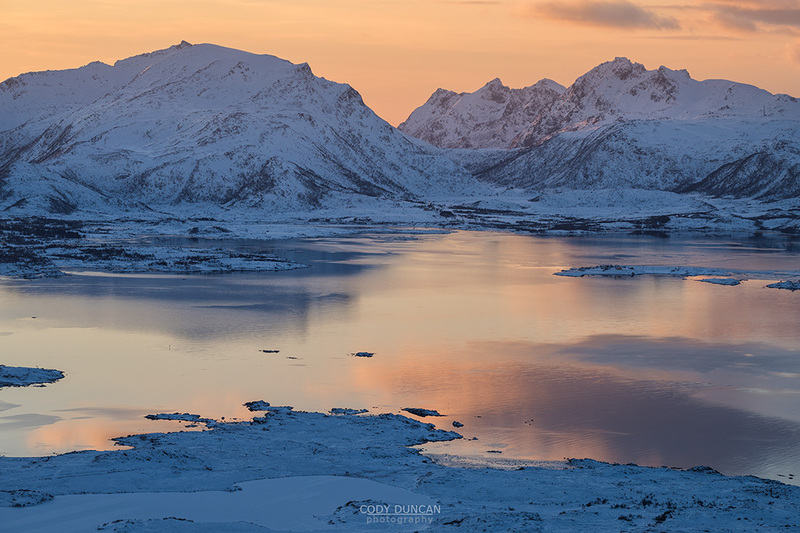 There is barely four hours of daylight on Lofoten as the middle of November arrives and passes. Each day feels darker and darker, even with clear skies. Under heavy clouds, in feels as if the world will soon turn to night – which it will. After a week of heavy winds and rain from multiple passing storms out of the south, the weather finally settled a bit on this day. Though the forecast called for rain my mid afternoon, I took the risk to head east to Gimsøy to hike up a new mountain for me, Persatind. Starting the hike at noon, I already felt as if we should turn around; that night will soon arrive. But the heavy clouds were responsible for this as we still have a few hours of decent light. Fresh snow had fallen overnight and as we ascended higher up the mountain a cold wind began to blow. Following a maze of sheep trails up a steep and snowy ridge, the route finally arrives at the broad plateau of Høgheia – Maybe a good spot for some winter camping later in the season. Clouds of the approaching snow and rain were slowly drifting in from the south, layers of distant mountains fading into a blueish grey. 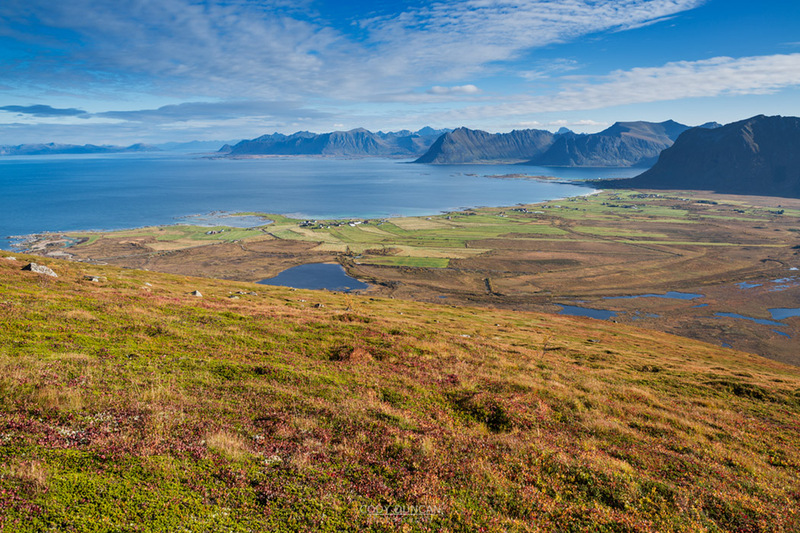 To the north, a twilight glow warmed the horizon over the distant islands of Vesterålen and the open sea. With another one of mid January’s fantastic winter days, and the day after I hiked up Offersøykammen, I found myself a bit bored again, so I headed up Hoven, a small mountain on Gimsøy. Luckily, I again had a few footprints in the snow to follow, taking away any difficulties in winter navigation. Though even in winter, Hoven is a relatively straight forward and simple hike, it’s always nicer to have a path to follow, if only to save on time. By the time I reached the summit I was down to a t-shirt – so much for arctic circle in the heart of winter! But a moderate breeze was blowing, so I quickly returned to a down jacket once I stopped moving and started shooting. The southern sky, with the noon sun low on the horizon was glowing a bright orange. At this time of year, the sun is so low in the sky that only southern facing aspects of the islands receive any direct sunlight, and that’s only if their not blocked by any mountains. I liked the reflection in the water below, and the contrast between the cool blues of the snow and the warm sky. 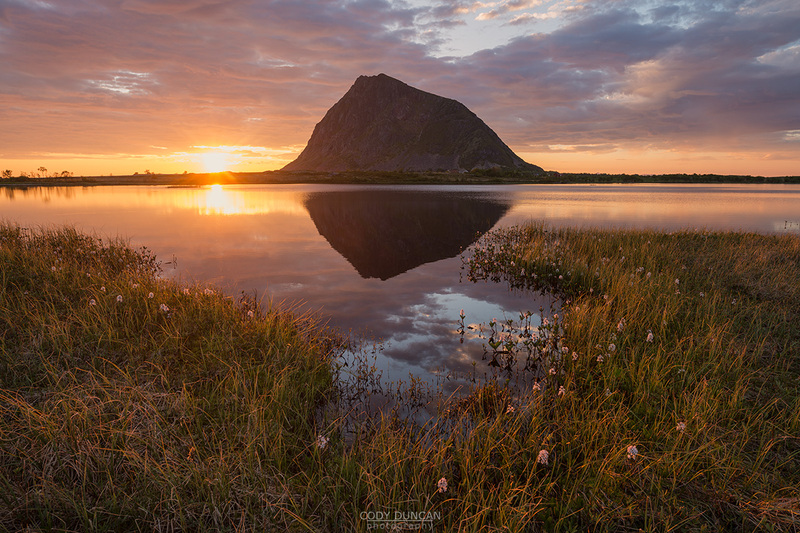 Hoven is something of a unique mountain on Lofoten in that it stands completely alone, surrounded by the flat, marshy lands of Gimsøy. I’m not sure what geological effects resulted in its creation, but today it sits, despite its low height, as one of the most recognizable mountains of Lofoten. As autumn progresses and the land fills with color, Hoven provides a scenic view over the surrounding landscape. Though it is a landscape under threat.